Thursday, February 25, 2010 at 12:04 a.m.
OLD TOWN  Every week in the outskirts of Old Town, where the Kumeyaay Indians were colonized by the Spaniards more than 200 years ago, scores of urban Indians meet to dance, eat and keep their heritage alive. Some children and their families perform traditional grass dances while others beat on drums and sing native songs. The weekly meetings at the Ballard Parent Center are part of the San Diego Unified School Districts federally funded American Indian Education Program. In addition to the music and dance offerings, the program also helps the districts Indian students with tutoring, counseling, career guidance and other services. The program is designed to support American Indian children who do not have the benefit or network of services offered to those living on a reservation, said Director Vicki Gambala, who oversees the program and its annual $80,000 budget. 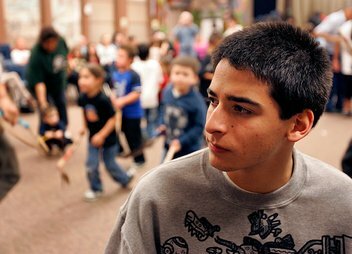 Of the districts 130,000 students, 680 are listed as American Indian. A little more than 400 participate in the federal program. Chandler Hood, a senior at High Tech High, remembers being a student at Hearst Elementary School in Del Cerro and being asked if he lived in a teepee. The program picked up where the history books left off, usually right around the fourth-grade lessons about California missions. San Diego Unifieds American Indian students make up a fraction of the districts population. The demographic is so small that it rarely  if ever  surfaces in discussions about test scores, dropout rates or attendance. Yet American Indians score among the lowest of any other ethnic group. 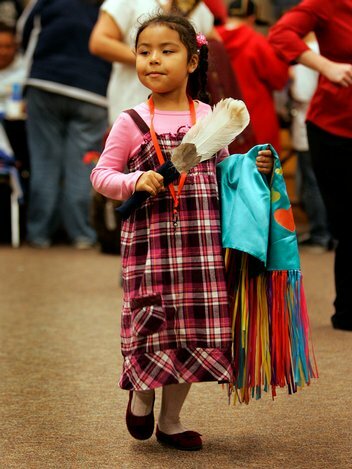 Yumiko Cambridge, 5, of Point Loma danced during the weekly American Indian Education Program gathering at the Ballard Parent Center in Old Town. Chandler Hood, who is part of the Navajo tribe, said he remembers being asked when he attended Hearst Elementary School if he lived in a teepee. Gambala and other advocates in San Diego County are encouraging American Indians to participate in the U.S. Census. They believe American Indians are vastly underrepresented, in part, because of a historical mistrust they have of the federal government. A stronger representation in the census would boost federal dollars for programs that help the small population, Gambala said. A Census Powwow to promote the effort will be held from 11 a.m. to 10 p.m. March 20 at Barrio Station, 2175 Newton Ave.